This crochet tip for keeping even rows will make you wonder why you didn’t think of it before! Keeping even rows while crocheting WITHOUT counting is super easy to do with this simple tip. 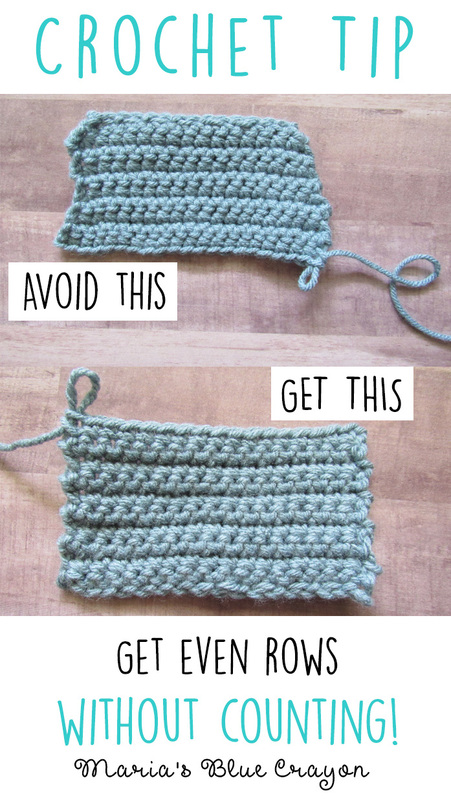 I’m going to assume when people learn how to crochet, they learn by chaining then making rows to create a blanket or dish cloth or some sort of retangular shape. When I first learned how to crochet, I made a blanket (that I never finished). I was a pro at increasing by accident and it made my blanket look uneven and wonky. Not only was I 8 years old, but when you start crocheting it’s difficult to see or even count the stitches because you just don’t know what you’re looking for. My blanket looked a little like this picture, except is was bigger and made with baby pink and green/red ombre yarn. It was as hideous as it sounds. HA! But in my own defense, I was a kid. So one way to get even rows is to go back and count the stitches, but if you’re a beginner and are unsure of what you’re even counting – this tip is for you. Even if you’re not a beginner, this may be a useful tip when making larger projects. I just started making a blanket in rows that is 200+ stitches across and I’m using this tip just so I’m sure I don’t accidentally mess up along the way and have to take anything out. So what’s this tip? How can I get even rows and make sure I have the same amount of stitches in each row without counting? And you don’t even have to go out and purchase stitch markers if you don’t want to. You can use bobby pins, safety pins, or even small pieces of yarn in a different color. Basically, you want to place a stitch marker in the first stitch in every row you start. 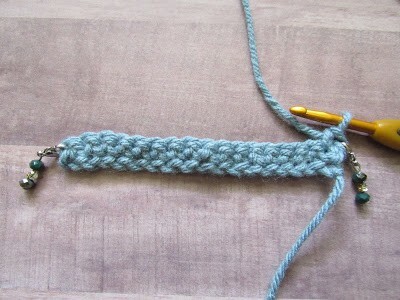 Once you have your chain and your first stitch of the row, place your stitch marker in that first stitch. 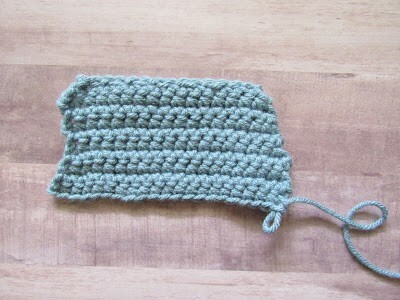 You can do this right away with your hook still in place, but if you are using a piece of yarn you will want to do another stitch then use your hook to place your piece of yarn in that first stitch. Continue to make your stitches down the chain. It’s easy to see where the last stitch will be in the chain. 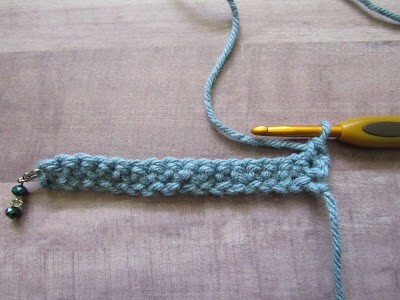 Turn your work, chain up (however many you need for the stitch you are using) and make your first stitch. 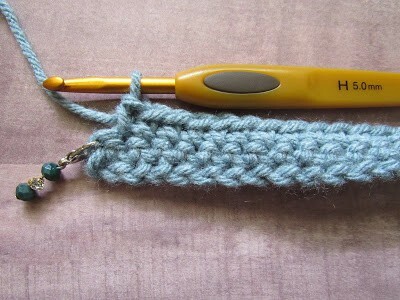 Place you stitch marker in the first stitch as explained above. Continue to make your stitches along the row. When you get to the end of the row, your first stitch marker will tell you where your last stitch will go! You don’t have to second guess if it is the last stitch. 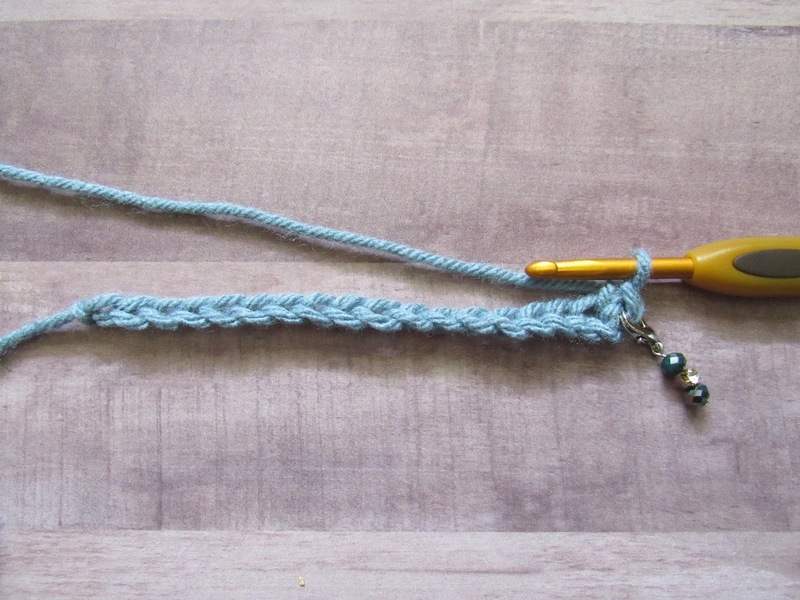 All you have to do now is keep moving the stitch marker up after each row and place it into the first stitch of each row! And ta-da! Even rows! This may get tedious when making a small dishcloth, but it will ensure you will have even rows and takes less time than counting the stitches across! Like I said in the beginning, I’m making a blanket that is 200+ single crochets in width, so this is a life saver for me so I don’t ever have to second guess where my last stitch is! **NOTE: When working in rows, I usually don’t count the chain in the start of the row as a stitch. 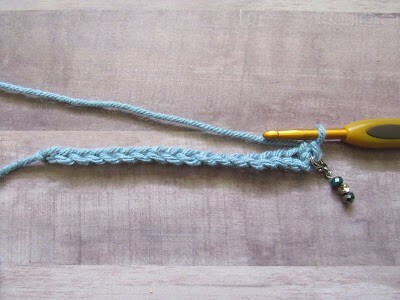 If you are counting your chain as a stitch, you will want to insert your stitch marker in the chain of each row. Example: If you chain up 3 in the beginning of a row and are counting it as a double crochet, you will want to insert your stitch marker at the top of that chain 3 as your first stitch. I have seen several solutions for this problem. This is the best one yet. Simple but smart. I need some cute stitch markers! AweThanks!some, I have mixed results but lookin for the last loop can be frustrating. Going to tryvthis! I am/was a stitch counter with 11 distractions in my household, so this will save me from making many, many more uneven blankets. Thank you! Great idea! I am new to crocheting and recently had to pull apart a large blanket because it was so crooked. I'll try this in on my current project. Thanks! I have been crocheting for years but never made a blanket before now. Same thing happened to me. I'm 1/2 way through the blanket, laid it out on my bed to proudly show my son how his blanket will look and was shocked at how cooked it is. I'll start over and definitely use markers. This is a great tip!!! Thank you for sharing! Thank you for sharing. I am new to crocheting and have taken apart my blanket 3 times because it was uneven. I have begun teaching Beginner crochet. In the first lesson I emphasize dye lots, gauge, and use your stitch marker as a reminder to count each row. It saves a lot of frogging. great idea. I think of doing it and get lazy. I hate counting and ripping out!! thank you. I've ripped out a cot blanket for my grandson to be 5 times because it alway turns wonky somewhere. Thank you for a great tip! If I'm able to post a pic here of the finished blanket I will ? That's an excellent idea! I have these little red mini clothespins from another project that I'm going to use to clip on my end stitch. I don't know why I didn't think of this — I always lose count! So if you don't count your chain three as the first double crochet stitch, where would you place your stitch marker for the first stitch? But, if you are counting your chain 3 as the first DC in the row, you would put your stitch marker in the to chain stitch, not at the top of the chains. If you put it at the top of the chains, you would effectively be placing your last DC of the next row between the two stitches. But if you put it into the 3rd chain, then you would be putting the last DC "into" the first DC of the previous row. Thank you for clarifying, Mary! I ultimately meant to put the marker on the ch 3 st. I can see how my wording could be misinterpreted! If you count your chain 3 (I prefer a chain 2) as your first DC then you want to put the stitch marker in the 3rd chain. If you place your last DC of the next row into the 3rd chain (or for me, into the 2nd chain) which is the same as putting the stitch into any other DC. But if you put your marker just at the top of the chain stitches and put the last DC of the next row into the open chain space then you are effectively putting your DC "between" the second to the last DC and the last DC causing a larger hole at the end of the previous row. Now as to why I use the chain 2 instead…..I HATE having too large of a hole at the ends of my rows. I have tried not counting the chains as the first stitch, but then I still have a bit of a lump at the end of the rows. If you are going to put a border around your project…you need to remember to put your stitches around not only the chain stitches but the DC on just the other side of those chain stitches as well. I hope this isn't confusing, but over the years that I have been crocheting, these are the things that have gotten me through. The only time I actually don't count the chain stitches as a stitch is when I am working in the round. Though, when working in the round, I prefer using the spiral method instead. I also use only a chain 2 & whenever pissibke, I put my first stitch into the 1st space to eliminate the dredded gap/hole that is left when you don't. Ty Maria! U have no idea how grateful I am to learn this tip. I have been crocheting I would say 10 years. And I am beyond frustrated with having uneven edges. I hate to quit because I love to crochet I find it relaxing except for these awful edges. If ur method has cured me of this than this is nothing short of a MIRACLE! Counting especially when I have at least 65 stitches across doing a small lap blanket is annoying! Ty!!! Best tip for keeping it straight. I am somewhat self-diagnosed ADD; so hate counting stitches. Thanks for sharing. Hey Maria, what sized lobster clasp did you use to make those stitch markers? Yes – please. I'd love to make some of those with beads I have on hand. Thank you, Maria, for a great tip! 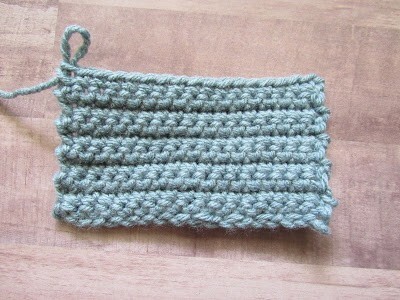 I've been crocheting for 50 years and my rows are usually Even; however, this often involves some counting. Your tip will make it so much easier than counting all those stitches! Your stitch marker is adorable! You should market them. I'll bet they'd sell like hotcakes! Thanks again! I now have a use for the dangle earrings I never wear! So simple! Almost a "no duh" LOL. But, who would have thought. I use safety pins as stitch markers. Nothing fancy. But, I do like the idea of the dangle earrings too because I have some singles that lost their mate. Aha! Honestly, I thought it was normal and I just didn't know how to block properly! Thank you so much! I've discovered that paper clips work well too, if stitch markers aren't available. But I also like the tip about using dangle earrings! Thanks! sorry- new to this. Do you put them at each end? I am so glad I found this. I have made like 3 blankets before, but I was using motifs and joining them. They look ok. I did a little blanket for a baby once, and it was so wonky, I had to (and that was the only way to go as I couldn't understand the explanation in the pattern) sew a fabric border to hide the wonky edges. Now I am making a throw and I started with 140 chains…the first 30 rows look amazing! But I am on the second part, and I already see it's all wonky but there is no way I'm frogging it. I'll make another beautiful fabric edging. But from now on, I'll use your wise and wonderful advise. Thank you for this beautifully simple, yet brilliant solution. My recent crochet cardigan turned into a bit of a "swing style" as I seem to always (accidentally) increase on my edges. As I also have some pretty dangle earrings that have lost their mate, this will work for me wonderfully. Thanks! I've always used stitch markers since the very beginning and I've always counted my stitches-no matter what I've made. I tried your method and I am in the middle of frogging 1/2 of a lapghan. I have no idea what happened? I'm going back to my old way of counting every stitch and row. I use a stitch marker every 20 stitches. Such a simple thing,…….thank you! I also leave the stitch markers in so that I don't have to count rows either. My projects were looking really bad for awhile, but then I started using stitch markers. I read it on you site and that’s how I began really using them. Thank you.